Commodities have and continue to be a fantastic trading vehicle for those who can stomach volatility. After last year’s market crash most commodities pulled back to normal if not lower than normal trading ranges. This allowed us to enter the market at 10+ year lows for natural gas. 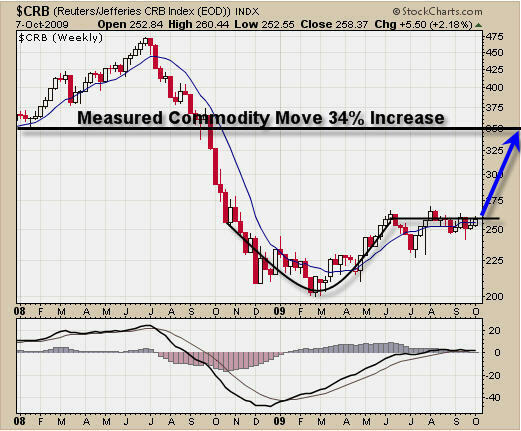 If we look at the weekly chart for gold, silver, oil, natural gas and the CRB commodity index we can see that commodities in general look ready to skyrocket higher approximately 34% on average in the next 4-12 months. Take a looks at this chart of gold. 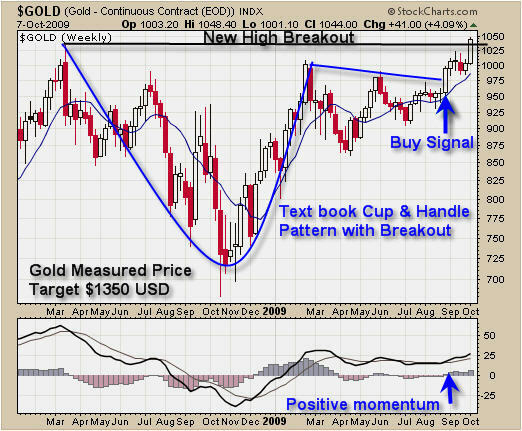 While this chart shows the basic technical analysis of the price of gold you can see the completion of the Cup & Handle pattern which is VERY BULLISH. Also you can see gold broke to a new high. While I don’t like to trade new highs it’s hard not to want to buy into this breakout. Most traders should be long gold already, but if you are not, you have a couple of options. Buy into this breakout with a tight stop or wait for a pullback and buy on a test of the breakout. Personally I am waiting for a pullback (test of breakout) before I add more to my position. Silver has been strong but has not held up its value as well as its big sister (gold). 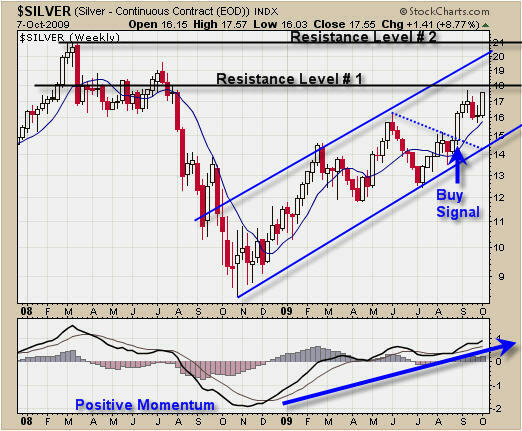 As you can see silver must break through two more major resistance levels before making a new multi year high. Overall silver still looks strong and I will be waiting for a low risk setup for us to add more to our positions. Crude Oil looks like a perfect Cup & Handle pattern and I am now looking for a low risk entry point which should form before we get a breakout it to the up side. 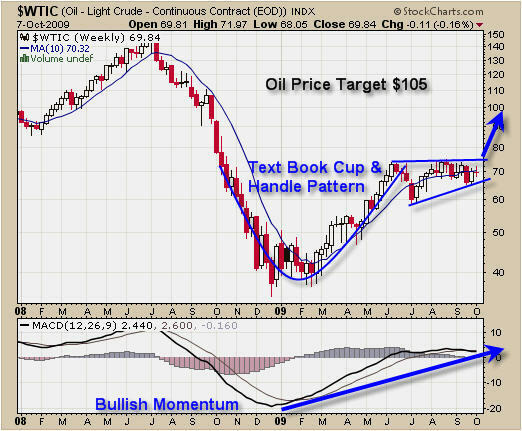 I can see oil quickly moving to the $100 per barrel level once we get a breakout. Natural Gas had a perfect shakeout in August and many aggressive traders who follow these reports followed my lead and bought natural gas around $2.90 (10 year lows). This was the move I wrote about for nearly 3 months as we waited for it to unfold. Down side risk was around 15% so it was not my signature low risk setup but this rally has been exciting. 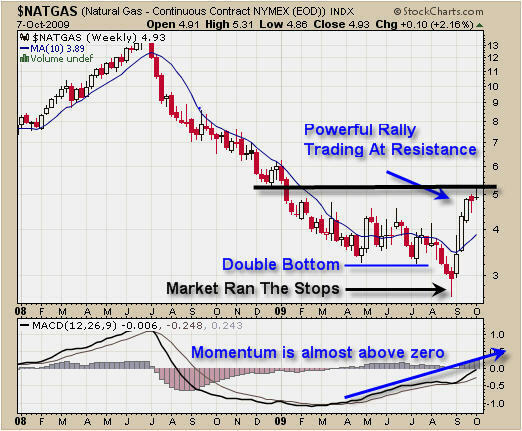 Currently natural gas is trading at resistance and taking some money off the table is a great play here. You will never go broke taking profits. The CRB Index looks very similar to crude oil. Overall commodities look to be in the final stages of basing (bottoming) and from simple technical analysis the next more could be around 30-34%. Overall commodities look like a great buy. We are seeing precious metals moving up strongly and gold making a new high which is very exciting as our golden rock stock plays push higher and our commodity ETF play continue higher as well. Energy is a mixed bag. Oil looks bullish and ready for a nice rally, while natural gas looks a little top heavy as it trades just under resistance. We continue to stay in the market and are waiting for another round of low risk setups which could happen in the next few days if we get favorable price action. Remember to move your stops up to lock in gains. There is nothing worse than giving back a large portion of your profits when you don’t need to. Gold & SP500 Day Trading Gone Wild & What’s Next?